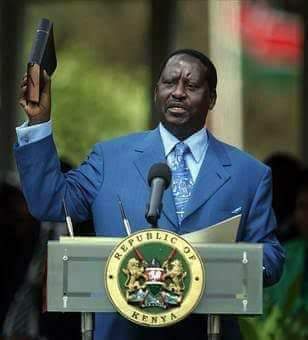 Raila Odinga today took oath of office as official leader of peoples republic of kenya. The word is "People's President." I told you that RAILA is a joker. He CAN NEVER DARE. He was sorted LOOONG TIME ago. Kalonzo Musyoka and Musalia Mudavadi chickened out. #NASAOathDay. He will not be charged because he did not swear himself as the President of kenya but peoples president of Kenya. He did not read the oath of assumption of office exactly the way it was written in the constitution but came up with his own words to be a leader of the peoples assembly of Kenya. He will be leading the peoples assembly and nothing else. He will have no real power, it is just like swearing in a church leader or a village elder. Raila hoped the government will stop the event but all was in vain because it was allowed and he is now the official leader of the peoples assembly.